The film was originally released in South Korea and later on to other Asian countries. It became an instant hit and in effect a Hollywood version was produced. I honestly haven't watched the original Korean version but I'm pretty sure that it is equally beautiful. It's been a while since I shopped at my favorite video stores. I initially wanted to buy the Toy Story series, you see I'm very kid at heart. I still enjoy films for kids. I was contented with my two Toy Story VCDs, when I saw a DVD of My Sassy Girl for only Php 175 (around $4). I haven't read any reviews about the film. But a friend, who I remembered saying that this was one of her favorite movies, prompted me to get it. I trusted her taste, so I bought it. I initially watched the film on a Friday night, after my tiring shopaholic escapade with my friend, Wella. I was so tired to watch the film so I ended up sleeping with it. My second attempt to watch the film was Saturday night and I ended up falling asleep again. Hahahahaha! Sunday afternoon came and since I am equipped with plenty of sleep, I was able to successfully watch and finish the movie. Finally! To be honest, my expectations for the movie was not that high. It will just be one of those typical romantic comedy films. But after watching the film, I ate my words. 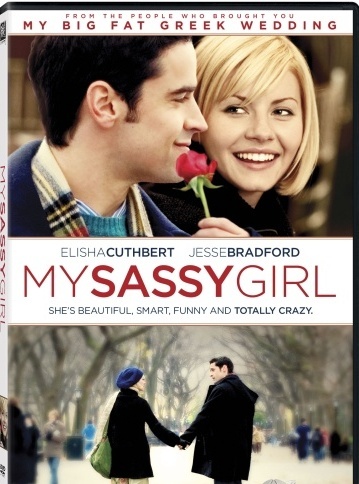 My Sassy Girl was one of those ordinary, cheesy, comedy, and romantic films that..... I LOVE LOVE LOVE! My Sassy Girl is the story of Charles.. I mean Charlie and Jordan Roark...as in R-O-A-R-K, two persons who are not just meant for each other. Charlie was a promising business student while Jordan was a heartbroken, pathetic and habitual drinker. Their paths crossed at the train station where a drunk Jordan, who got almost hit by the train, was saved by Charlie. After that incident, Jordan started chasing Charlie. The boring and typical life of Charlie drastically changed. The love story of Jordan and Charlie seem to be almost perfect. But a painful experience from Jordan's past was hindering her from loving Charlie. But after parting for a year, destiny rejoined them together. The only man I'll ever envy is the man you'll be with. I wish you a story of with a happy ending and the wisdom to look for it. When destiny wants to accomplish something, it can't do it alone. You still have to build the bridge to the one you love. Wow, I can't wait to watch it!! It sounds like my kind of chick flick! Looks like a really cute movie. Love the quotes! Thanks Jfam and Date Girl for dropping by my rarely visited blog and for your comments too. This brightens up my day! This looks great! I love falling in love kind of movies lol! I think I'll be pulling this up on netflix. I will let you know how I liked it! I want you, Cath Kidston! My alma mater did it first!